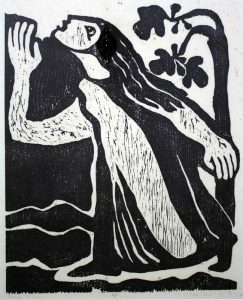 “Over the hill country,” a woodcut by Sister Chiara Pauloni, OP (1922-2011), represents the visitation of Mary to Elizabeth. Sinsinawa Art Gallery will host the jubilee heritage exhibit, “Preaching through the Arts,” June 4-July 31. This annual summer exhibit will feature artworks by Sinsinawa Dominican sisters from early days to the present as well as sisters from three other Dominican congregations, all in honor of the 800th jubilee year of our Dominican family, the Order of Preachers. For over 800 years, Dominicans have continued to preach the Gospel in word and deed. Today, thousands of sisters, nuns, priests, brothers, associates, and laity minister in more than 100 countries around the world. The arts have been an integral part of the Sinsinawa Dominican congregation’s heritage. For more information, contact Sister Priscilla Wood, OP, at 608-748-4411 or visit our website at www.sinsinawa.org. Sinsinawa Mound, the Motherhouse for the Sinsinawa Dominican Sisters, is located in southwest Wisconsin on County Road Z, off Highway 11, about five miles northeast of Dubuque.